I love to know whose out there cyber-stalking me, so feel free to leave your name, comments, link to your own blog, or any other random pieces of information you’d like to share. Be sure to list your city and state just for my own crazy curiosity. Oh, and feel free to share how this blog has changed your life, saved your marriage, caused your divorce, or just generally improved the quality of your life. Go ahead and share. You’re among friends here. I’m the most odd one here. I’m an Indian immigrant doing a boring job somewhere in Long Island NY. I spend my free time, mostly during office hours (9-5), reading news and other aricles in internet, with one hand scrolling mouse and the other hand on ALT-TAB, ready to flip the page whenever I hear my manager’s footsteps. I started reading blogs few weeks back and I immediately loved stuffwhitepeoplelike blog, thegoriwife blog and yours at the first sight. Even though most of the stuff here is very girly, I can secretly say I enjoyed some of them. Your writing is very creative. Keep going! keep on bloggin’, it’s people like you who keep the rest of us sane and in stitches! 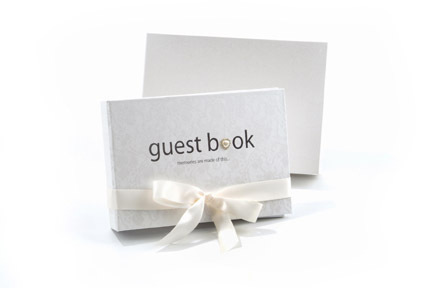 Great blog…and this guestbok is a great idea…I may just have to “borrow” it….I’ll call it something different though…with your permission, of course. I’ll have to share Tim and my story… you’ve inspired me. Hi! I’m Chloe, from Spain. I’ve just found your blog when I was looking for “marriage” and things like that on the Internet. Thanks to you, I had a great time (2 hours!!) reading your posts! and now I’m hooked!! I love the way you write! PS: I’m so happy for your pregnancy!! Congrats! Hi! I just found your blog today and have enjoyed reading some of the posts; you have a great sense of humor. As other people have commented it is great to read parts of your love story. I met my husband in college and even though it hasn’t been that long I feel like we were such kids then! I can’t imagine if I’d known him since high school. Oh and I’m in VA right now but originally from Oregon. Hi, I’m Sarah and I came across your blog by googling “married young” or something to that effect. I’m on my way to be married just after I graduate college and was looking for something on marriage that wasn’t about divorce, or how horrible being married is, or about how many relationships fail. So thanks for not being a debbie downer like the rest of the world and sharing the happiness of your marriage with us all. This is a great blog. I’m sure that whatever books you write will be super successful. I have really enjoyed reading your blog for the last few hours as a procrastination to homework. It is quite exhilirating to read about all the challenges and joys of married life! I can’t wait to experience it myself. Alas, I am a freshman in college and therefore marriage is a lifetime away, it seems like. But I just wanted to let you know that I’m a young christian girl who really supports what you’re doing! ( all though i am the laundry notzie and he is the penny pincher) WHAT A COMBO. Thank you so much for being so honest and funny out there in the cyber world. So here is one of you dear closest friends in cyber world. SEE NOW WE ARE FRIENDS! I stumbled across your blog yesterday and am loving it! I started at the beginning and have read through July (’till the post when you asked people to come write in your guestbook!) I’m a senior at a university in Washington. I’m totally single, but I can’t wait to be a happily married girl. In the meantime, I get my fix reading blogs like yours! This is such a fun way to stay in touch with you and Chris. You are a terrific writer and I am volunteering right now to go with you on your book signing tour! I love your blog! Aaron and I have started a blog so our family and friends can track our baby adventures. You can find it at paintedpants.wordpress.com! Hope you and Chris are well and if you are ever are in Tallahassee, please let us know! I found your blog on the WordPress homepage and have loved reading it. It has been a while since I have been here (my apologies), but I just wanted to congratulate you and your husband on the pregnancy. No stranger here, I was in your Mom & Dads living room when you told all (John, Larry and Charlie) that you were going make them Grandparents! Congrats. This is the first time I have ever been to anyones blob and I read all your entries in the past two days. I enjoyed every word of it and found it(you) to witty, funny and very down to earth and I know that you are beautiful young Lady. I will continue to read your blob. I found your blog the other day when I googled “The Cupcake Truck.” I’m thinking of driving to New Haven from South Carolina just to see this for myself. I am a soon-to-be bride with a new home, so I enjoy reading about you and your husband’s fights about paint colors and yardwork. Reading your blog has become a new daily ritual for me. Keep up the awesome work! I’m another stranger stalking you from the ‘net. I love reading about your life – and realize it’s quite hectic like mine (except I have kids). My fur kid Lola is a lot like your Molly…a serious nut! Keep up the great work in entertaining us all with everyone’s antics (and Chris’ boxers – *grin*). Is there any way to contact you? Couldn’t find anything and I was wanting to ask you a non-public-style question… Thanks! Aunt Lois sent me the link to your blog and I love it. Reading about my extended family has been such a comfort during mom’s death. I remember you and Jen when you were just tiny girls and you both grew up beautiful. Maybe we can get all the family together sometime. Please send your family my love. Your…cousin (i think) in Tennessee. i’ve been clicking around for the last hour or so and ended up here. looks like such a fun blog. i’ll be checking back. we’ve been married almost 12 years and have three children, but as crazy as it sounds, still feel like newlyweds in a lot of way! enjoy your journey. It looks like I am the only boy to say hello besides Chris. Soo…Hello! I just found this on your facebook page KT and it is great! I have been cracking up! I found it so enjoyable that I sent it along to my mom. You know…the fabulous Mrs. Hannum? There is a new Mrs. Hannum in my life. Yes, that’s right, I got married. On August 2nd to a lovely lady by the name of Stephanie. I included our website. It is not quite up to date since we just got back from our honeymoon yesterday but it will be soon. Well, I hope all is well with you two. Keep in touch. I am your Grandma Barnes’ pal whom we met in 1995 on one of the trip to Russia and never loose touch ever since. As a result of our friendship, I was honoured together with my family members to attend yours & Chris wonderful wedding as well as getting to know the rest of the family members better. I am glad to be and to nurture our friendship too. I fall into the stranger category…My name is Lisa, I’m a Canadian living in Dubai, United Arab Emirates. I came across your blog one day, doing a web search for something, but can’t remember what it was…definitely not Godzilla though! I read a few of your posts and now I’m hooked! You have an excellent way of writing and are soooo funny! I end up reading a few of them to my husband every once and a while because it reminds me of our newly married life as well! 🙂 Keep up the good work and I look forward to seeing what life throws your way next! found your blog at random, and now I’m reading back through. I love the way you write! great blog.. i love your smitteness!! Hi Katie! As you move on into this next school year ( and after all, how does anyone outside of academia even process a January-December calendar?) you may experience weird feelings. For me it was very strange to transition from Yale grad spouse, to somebody who just lives in the greater New Haven area. So, I just want you to know…. I’m still here too!!!!! My life is changing this year as well, but I really want to keep up with you guys. We should get together soon! Even a toddler-less evening out would be LOVELY! So, who am I? I am your ever-devoted reader and friend, as your blogs entertain me to tears nearly every entry. You are so crazy gifted at writing and I’m so delighted to see that you are going to write a book. I don’t care what it’s about (although, the ins and outs of the Yale music department would be fascinating to me, and me alone.) but whatever topic you choose, I know it will be so rewarding to all to lay their eyes upon it. I’m a real old friend, hey but not that old. I’ve known Katie and Chris since middle school. Good times. Thanks Katie for inspiring me to move over to wordpress. And it’s fun to hear what you all are up to. I guess I’m in the “stranger” category, though it is weird to think of myself as a stranger. strange, maybe. I also have commented before, once. I’ve got a blog too, which I also do not mind if random people read. I’ve self rated it no higher than PG-13 and the most private stuff always stays out. Hi! I’m erin! I found your blog when I was googling some things one day…I two am a young married girl living in CT…right next door to your new town actually! I love reading, and subsequently laughing at many things that I experience just as you do! And for a shameless plug like emily…(ezietz.blogspot.com). It’s not quite as interesting but occasionally entertaining! Hi, I’m Jacki and I’m another one of those strangers! I’m from Sydney Australia and have my own blog. Can’t remember how I found yours, but really enjoy reading it. My step-father sent me a link to your blog, the one titled “Apple is ruining my marriage.” He is – obviously – a Mac person and tries to convince everyone else they should be too. So he sent me a link, and I found your little blog. It have to say its quite enjoyable. I like how you are a real person. Unlike some of the other blogs I like to read. So my name is HeJo. It sound a bit funny my but name is Heather and as of 2 months ago my new last name is Jonhson. Being so generic the in laws and I tried to think of a nick name…clever eh? Our signature drink at the wedding was of course called……champagne and chambord is delicious by the way! I am a transplant from the D.C. metro area and now reside in Rhode Island. There, now I don’t feel like a stalker anymore and you don’t feel stalked. Wohoo! Hi Katie (and Chris)! I found your blog in the midst of “research” – I’m considering starting my own (still too daunting, but we’ll see). My husband and I just bought our first home, and moved from a suburb of Boston to an even smaller, farther suburb of Boston. 😛 We’re about a month ahead of you guys in terms of the moving in process, but your experiences sound scarily familiar! Congratulations on all the exciting changes in your life and keep up the great blogging!! Hello! I am one of the strangers. Mine name is Betty and I am slowly becoming bald in pharmacy school down South. Your blog is great, but sometimes it makes me want to laugh outloud in class, so it’s dangerous sometimes, this blog of yours! I really enjoy every thing you’ve written, good luck with the book! I’m the younger (beautiful and brilliant) sister. So proud of you Kate for writing this blog – I read it daily (as you know because I email you if you haven’t posted yet) and love to feel a bit more connected to you since you insist on making the yankees your neighbors. Come back to the south and have a baby, please. That can be the sequel to the Confessions of Young Married Couple book… Confessions of Young Married Parents. I love reading your blog! I can’t wait to live out amusing (and sometimes mildly dysfunctional) stories with my own Prince Charming. P.S. If you find him, let me know. I am the first, woo hoo! I am the husband from which this blog frequently comments on and I reside in Stratford, CT. Since most of my life is posted daily on this blog (including my choice of boxers) I would say that it has changed my life (except i am wearing valentines day boxers right now) and has definitely improved the quality of my life overall because while kate is blogging i can have the tv to myself. Love you sweety.